SeeYourBox is a tech-service platform that leverages IoT devices and sensors to collect, analyze and extract information across all steps of the supply chain. With over 60 different services ranging from temperature control to real-time pattern recognition, SeeYourBox offers the ultimate one-stop solution to all customers in need to acquire detailed information on goods that are traveling, stored or used around the world. Where did the idea for SeeYourBox develop from? 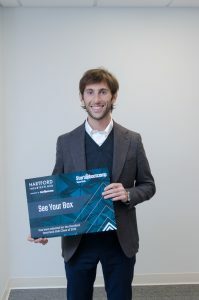 The idea originally came from Marco Toja, SeeYourBox’s (SYB) founder. Thanks to his long-term experience in the business consultancy, Marco realized there was a lack of solutions which focused on monitoring the goods, and not the means of transport. That was the spark that pushed him to start working on a new and innovative solution to monitor goods, based on IoT. Why did you choose the name ‘SeeYourBox’? The name tells exactly our main goal: to see your box. With SYB’s solution, the clients don’t monitor the truck, the container or the ship, but they constantly follow their product, along with all steps of the supply chain. Who is your current targeted audience? SYB is currently serving the food & agribusiness, the fine arts, pharma, and the industrial machinery verticals. In the last year, we have started collaborating with the insurance business, which is across-industry including all verticals. What do you think has been SeeYourBox’s biggest obstacle, and how have you overcome that? Probably one of our strongest points is also one of the biggest obstacles: offering an extremely innovative solution. In such cases, when the market is still in its very early stage, you need to invest a lot of time and resources to “educate” your potential customers, making them understand how big is the potential of your solution. We are still struggling with this matter, but much progress has been done in the latest years, also thanks to increasing global awareness about the IoT and its potential. How do you think SeeYourBox is going to change the insurtech industry? SYB can bring enormous value to insurance players through its use of real data. In the past, insurers based their analysis only on simulations and statistics or invested in technology (e.g. black boxes) which provide too much data but with limited actual insight helpful for the insurer. SYB adopts a “white box” approach: the customer decides in advance which data to collect and those data are contextualized, related to that specific step in the supply chain. This way insurances can really draw a profile of goods and understand their behavior during transportation and storage. What made you want to join an accelerator program? We joined the Hartford Insurtech Hub because it was a great chance both to dive into the insurance industry, which is a market relatively new to SYB, and to enter the US market, which has great potential for us, thanks to its size and thirst for innovation. How did you find out about Hartford InsurTech Hub? We can say that it’s the Hartford Insurtech Hub who found us! Initially, a mentor from the Program, Jay De Vivo, found us on AngelList and contacted us to know more about our solution and how we were looking to significantly improve visibility into the monitoring of goods. We were then put in touch with a scout of the Program and from there, our journey with the Hartford Insurtech Hub began. How has your experience in the accelerator program been thus far? We are absolutely satisfied with the program so far: in less than 6 weeks we had the possibility to open more than 10 qualified leads. With one of program partner insurance, we have already identified a possible case which can be transformed in a POC in property and casualty business lines in the short term. What has been the best advice you’ve received thus far in the accelerator program? Study, study, study! To provide an innovative service solution to an insurance partner you must really understand their product offering, the business units you are working with and main decision drivers for any person involved in the process. What is great about the accelerator program is that as a startup you have access to a fantastic network among the SBC resident team, mentors and partners which is very helpful. We found great people always available to give us a bit of good advice and willing to share their experience in this sector. What advice would you give a startup that is interested in joining the Hartford InsurTech Hub’s accelerator program? We would definitely encourage them to apply! It is a great experience, starting with the selection process, which in itself is very accurate and formative for the startup. Then, if you are selected as a finalist, you have the chance to join a very well-structured program, which supports startups under every aspect of the life of a company and provides you effective access to the market you are targeting. In addition, the program has a strong network, which opens you many opportunities.